[ Edward VII, King of the United Kingdom and Emperor of India. ] 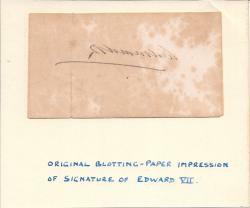 Autograph Signature ('Albert Edward') on part of letter. On 5.5 x 10 cm. piece of paper cut from the conclusion of a letter. Lightly aged and ruckled, with closed tear repaired on reverse with archival tape. Traces of previous mount on reverse. Reads: 'Believe me, | Yrs [last word underlined] very sincerely | Albert Edward'. [ Charles Lucien Bonaparte, ornithologist and nephew of Napoleon. ] 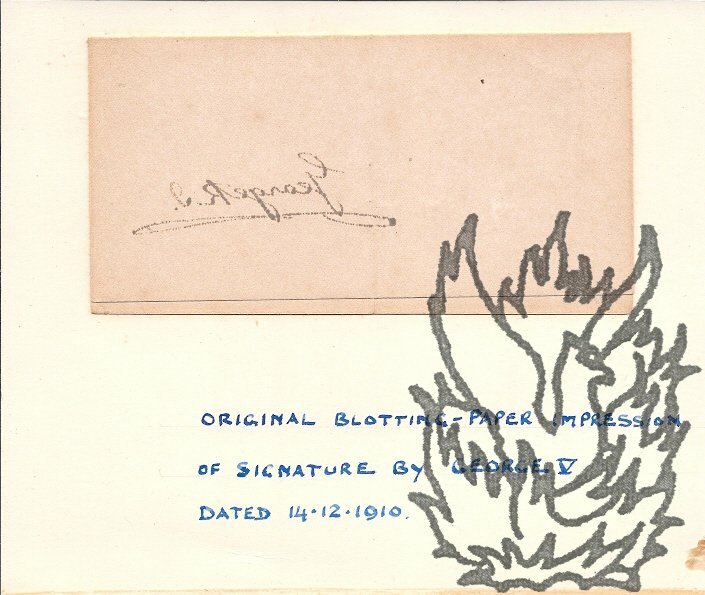 Autograph Signature (' C L. Bonaparte'). Place and date not stated. On 5.5 x 14 cm. strip of paper. Apparently written in response to a request for an autograph. Reads: 'I am much flattered by the demand | C L. Bonaparte' ('demand' being a mistake for 'request'). [Gaspar, Baron Gourgaud.] Typescript of 'Napoleon The Prisoner of St. Helena. By General Baron Gourgaud' (published with deletions as 'The St. Helena Journal of General Baron Gourgaud'). 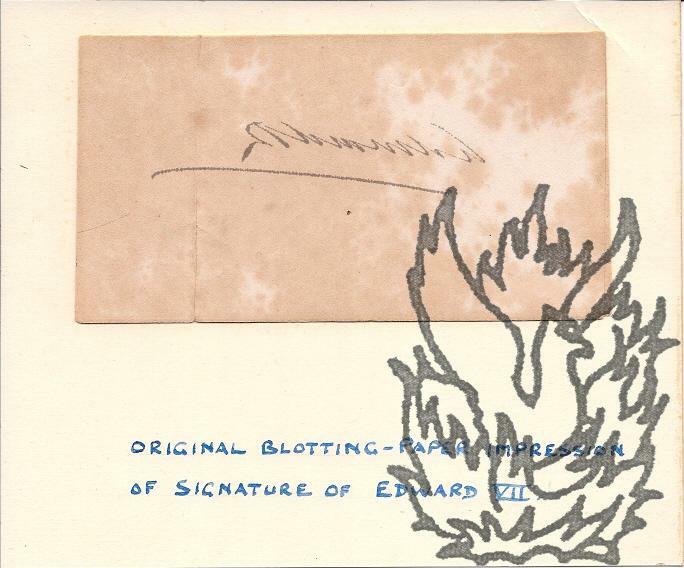 With autograph notes by Edwards and ALS from a later Baron. The typescript is undated, but precedes the publication of the book by John Lane The Bodley Head Ltd in 1932. 732pp, 4to, with the translation proper (paginated to 654), preceded Edwards's introduction (35pp, including five pages of 'references') and a section on 'The Gorgaud Problem' (42pp), the later featuring as an appendix (pp.337-356) in the printed version. Each page is typed on a separate leaf, and the whole is bound in a substantial red half-calf binding, with strengthened inner hinges. In good condition, on lightly-aged paper, with some wear to the binding. Autograph Letter Signed ('Granville') from Liberal Foreign Secretary Granville George Leveson-Gower, 2nd Earl Granville, to a 'Baron', stating his position on whether Louis Napoleon's 'mischievous motions' will bring about war in Europe. Bruton St [Mayfair, London]. 20 February 1852. 4pp., 12mo. Bifolium. Good, on lightly-aged paper. Of great interest, as giving the informal position of the British Home Secretary on what was at the time the most important problem facing him. Granville would only last as Foreign Secretary for a week after writing this letter, as Russell's Liberal Government would fall on 27 February. Ironically, his elevation to the post of Foreign Secretary the previous Boxing Day had been due to Russell forcing Palmerston's resignation over his unauthorized recognition of Louis Napoléon's coup d'état. The letter is addressed to 'My dear Baron'. [Catalogue by the London bookseller Francis Edwards, titled] How England saved Europe. Catalogue of Books, Engravings and Autographs relating to Napoleon the First and the wars in which he was engaged, 1793-1815. 'Offered for sale by Francis Edwards, Bookseller, Printseller and Dealer in Autographs, 83, High Street, Marylebone, London, W.' March1917. 46pp., 12mo. In original printed wraps, with the last two pages of the catalogue on the back cover. 704 priced items, with descriptions. Reproduction of no. 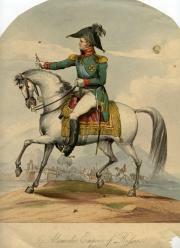 612 (mezzotint of Napoleon by Charles Turner from J. J. Masquerier) on front cover. 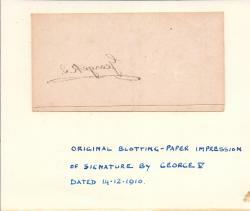 In fair condition, on aged paper, in aged and worn wraps, with occasional pencil markings in margins. 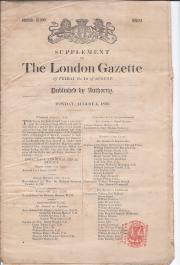 An important catalogue, issued in part to make a point during the Great War. 4 August 1856. Numb. 21909. London: Thomas Lawrence Behan, 7 Suffolk Place, Haymarket and 45 St Martin's Lane. Crown 8vo, 7 pp (paginated 2699-2705). Unstitched and unopened sheet, folded twice to make four leaves. Text clear and complete. On aged paper. 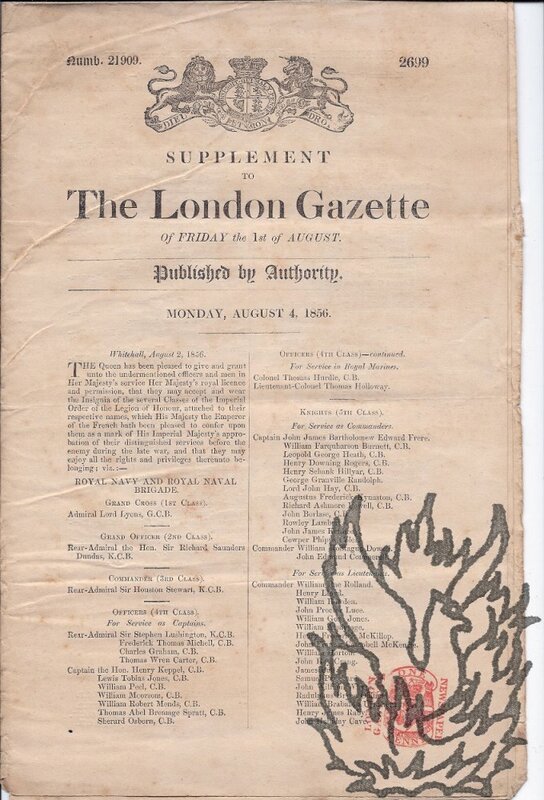 With red ink tax stamp: 'NEWSPAPER | ONE PENNY | LONDON GAZETTE'. A list of Crimean war officers and men awarded 'the Imperial Order of the Legion of Honour, [...] which His Majesty the Emperor of the French has been pleased to confer upon them'. From the archive of Lieutenant-Colonel George Lynedoch Carmichael (1831-1903) of the 95th (the Derbyshire) Regiment, who was made a Knight of Legion of Honour at this time. 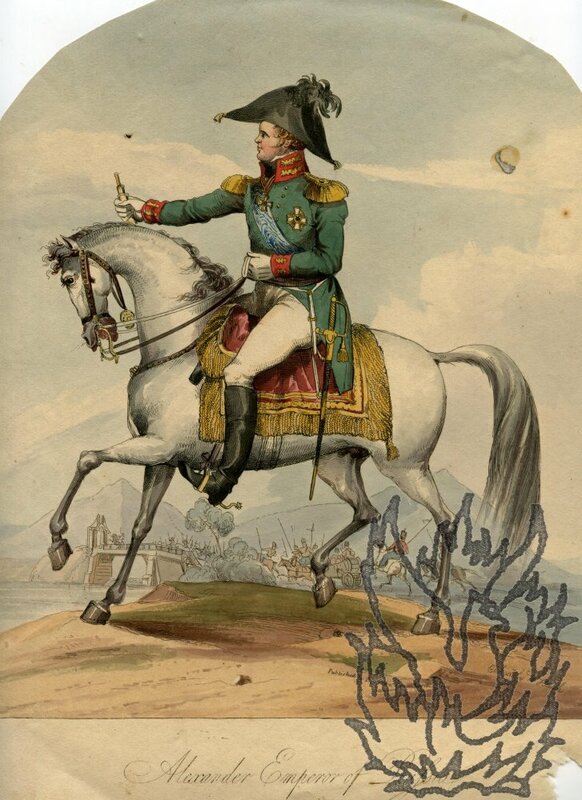 Handcoloured engraving, 'Etched by W Heath', 'From a Sketch by Paul <Sevinre?>', of 'Alexander Emperor of Russia'. 305 mm high and 225 mm wide. The print has been trimmed, with the top corners cut away to give the print the appearance of an arched window. A strip, 35 mm high, at the foot contains the caption, with the bottom right-hand corner damaged (not affecting print) by removal from backing. A good crisp impression, on lightly-aged paper, the only faults being loss to the sky above the Emperor as a result of the trimming of the top corners, and a couple of spots of glue to the sky.